Three men were able to walk away from an aircraft that flipped onto its roof during a crash landing shortly after noon Saturday at Steamboat Springs Airport. 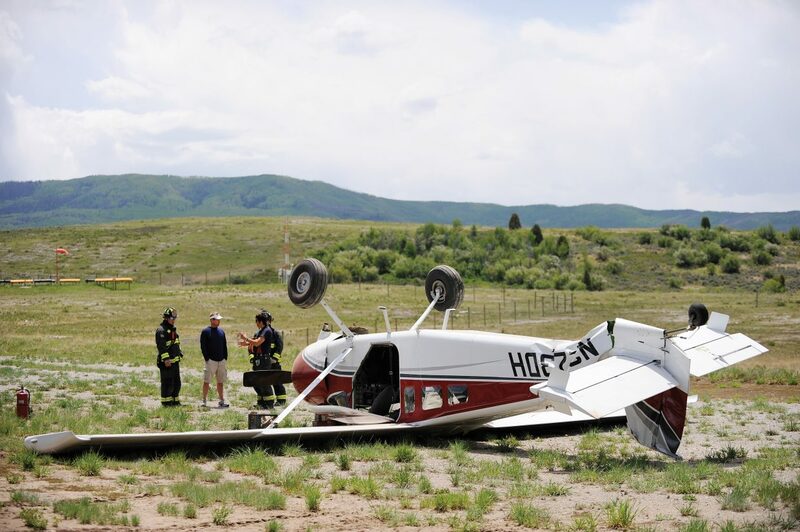 Steamboat Deputy Police Chief Bob DelValle said the single-engine propeller plane was coming from Eagle County and had three occupants, whose names were not immediately available. The men had only minor injuries, including lacerations and abrasions, and did not need to go to a hospital. “Landing actions like this with airplanes like this, it’s not unusual for people to walk away with minor injuries,” said DelValle, who also is a pilot. He said the pilot, who lives in Eagle County, had built the Murphy aircraft himself. “Unfortunately, it looks pretty wrecked,” DelValle said. The aircraft approached the airport from the southeast. “The wind on his landing may have switched to a tailwind, which does create a problem because most aircraft try to land into the wind,” DelValle said. The plane is known as a taildragger because it has two main wheels and a small wheel at the tail. Based on the five strike marks from the propeller in the dirt to the left on the runway, it appeared that the nose of the aircraft came forward and the aircraft flipped onto its top. Steamboat Springs Fire Rescue firefighters remained on scene because it was thought that fuel might have leaked from the plane and fuel still was in the tanks located in the wings of the plane. The airport was closed after the crash and reopened at about 2:45 p.m. after and airport officials removed the plane from the side of the runway. The National Transportation Safety Board is expected to investigate the crash. The last major incident involving an airplane in Routt County was Feb. 19 when a private Cessna 414A from Texas crashed short of the runway at Yampa Valley Regional Airport during a snowstorm Sunday afternoon. Two people were killed and four more were injured.